'Almond Joy' (Gene Gaddie, R. 1987). Seedling #86-2. MDB, height 7.75" (20 cm). Early to midseason bloom. Standards dove grey (RHS 196C to 198D); falls edged standards color; nut brown spots, rust (176B) at outer tips, chocolate (199A) at upper sides; dove grey beards. Puppet' X unknown. Gaddie's Gardens 1987. Honorable Mention 1989. 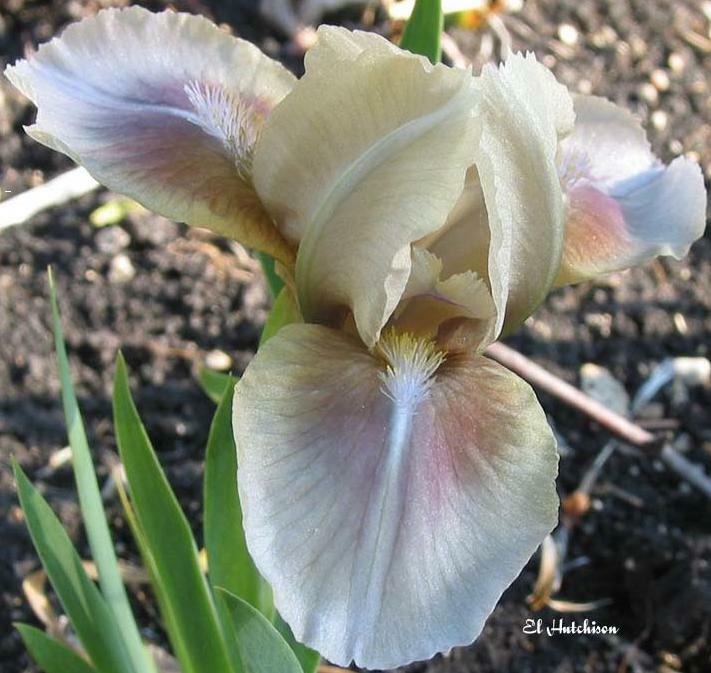 From AIS Bulletin #265 April 1987 Introducing ALMOND JOY-MDB-Light dove gray with a rich brown spot on falls that suggests an almond nutmeat; matching gray rim and beard. Short, wide, round petals; scrolled falls. Two buds (in terminal) on 7-3/4" stalk. #86-2: Puppet X unknown. $10.00. Gaddies' Gardens.